After the 1867 fire in the Poorhouse necessitated moving the paupers to homes in Hillsdale, the Poorhouse was sold to a former Poor Keeper, David Forbes. In the late 1880’s it became the home of the Wolcott family and was owned by successive generations until 1943. In 1963 it was purchased by Bob Evans Farms to be used for storage. In November of 1987 President Phil Wilson of the Hillsdale County Historical Society, after repeated pleas to Bob Evans executive Dan Evans, succeeded in getting the company to lease to the Historical Society 1.9 acres of land that included a barn, silo, hen house, and the former Poorhouse, a run-down, disintegrating cobblestone house that no one in their right mind would think could be renovated. Inside, the damage was as disheartening as it was outside. In addition to the mountain of trash and animal offerings, plaster was crumbling in many places, woodwork was in need of refinishing, and the stair railing was gone. The floors were uneven and unstable. The immediate need was to protect the Poorhouse from further damage. Martinen Construction was hired to build a new roof from the rafters out. Braman Roofing generously donated the roofing materials. Storm windows were installed to keep out the weather and the animals. In June of 1988 Phil Wilson was contacted by the Herrick Foundation and offered $50,000 to help with the renovation. Bill MacRitchie, a childhood friend of Ken Herrick, had told Ken about the Poorhouse renovation. Inspired by the project, the Herrick Foundation wished to make a contribution to the Historical Society... before September of 1988. This required fast, decisive action. First, Bob Evans had to alter their arrangement with the Society from a lease on the property to a quit claim deed so that the Society (and not Bob Evans Farms) would be the recipient of the Herrick gift. The factory owners were gracious in cooperating with that request. The second action required was that the Society, which had been operating under the 501(c)(3) non-profit designation of the Exchange Club, receive its own 501(c)(3) status. This was typically a two-year process, but with the help of Mike Nye and others, the application process was miraculously completed by the end of August, 1988. The Herrick donation, along with a State Equity Grant of $30,000 that was matched by over $37,000 raised in the Hillsdale County community, provided the bulk of funds necessary for the renovation. In a wave of support seen frequently in Hillsdale County, baked goods sales and donations from businesses, clubs, and individuals gave impetus to the renovation effort. Jerry Fallon offered the proceeds of his monograph, The Will Carleton Poorhouse, to the growing fund. Jan Wilson and Bob Keefer devoted 40-hour weeks to painstakingly cleaning, refinishing, and painting. On the advice of the architectural consultants, Western Waterproofing was hired to repoint the cobblestones on the north and west. 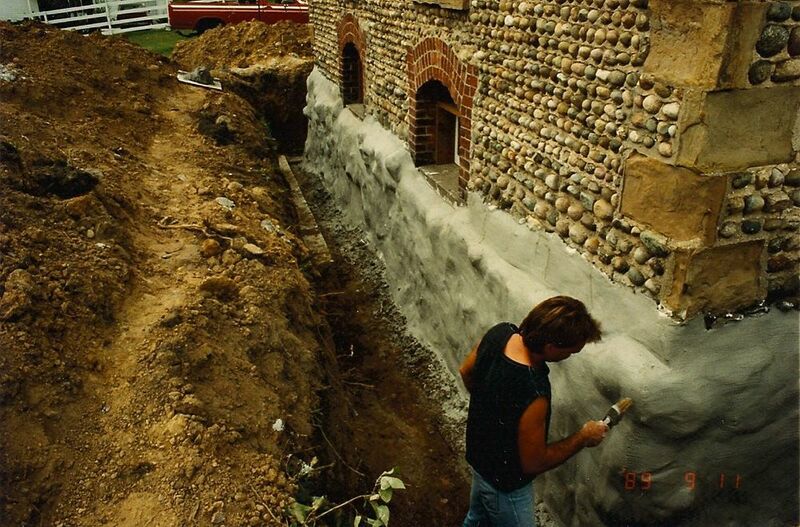 With the removal of the porch foundation, an example of the original V-joint mortar that ran between the rows of cobblestone was found to use as a model for the repair. The company also replaced the quoins at the two front corners of the house. (In 2005, when John McCormick was hired to repoint the remaining sides he was able to repair, rather than replace, the quoins on the back corners. Knowledgeable about historic masonry, John used a more appropriate mix for his mortar, increasing the lime content by two to three times, resulting in a stronger hold for the stones.) Dubois Excavating was hired to dig a trench 3-4’ wide around the house so that the foundation could be cleaned and scraped clear of the vegetation that had grown over the years. The foundation, too, was repointed and waterproofed. In the cleaning of the attic space, a single sidelight was found. Bill Houseknecht built a matching sidelight for the front door area. Then he constructed a door using lumber from a barn that was over 100 years old and attached an original box lock. The Presbyterian Church donated steps they were replacing, so these were used at the front door entrance. With the discovery of the sidelight, the creation of its mate, and the emplacement of a fan window above the new door, the house again looked like the VanDenberg home, built in 1853. The original pantry was altered to accommodate the installation of a half bathroom with the remaining portion still used as a pantry. Bob Keefer found porcelain door knobs to replace those that had been lost, and the stairway banister was returned to the Poor House by the Bob Evans executive who had stored it in Columbus, OH for safe keeping when the Poorhouse was used as storage. Vernon Stevens turned new spindles for those that were missing. The floors in the Keeper’s Bedroom and Parlor were replaced and colors chosen for the walls based on Hattie Marie Spiteri’s Early Americana magazines. The Poorhouse renovation had been completed and the building open for some time when two accidents necessitated the final major repair. Tony Fowler, removing Christmas decorations, went through the floor as he stood at the organ. Shortly after, Jan Wilson went through on the other side of the same joist. Neither of them dropped further than a knee, but the Paupers‘ Parlor received a new floor. Now sound - and safe - the Will Carleton Poorhouse has introduced hundreds of visitors to an important chapter in the history of Hillsdale County.